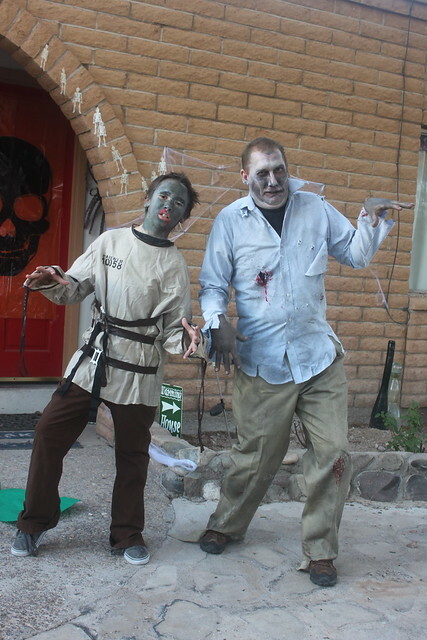 Ami and Conrad’s school had a Spooktacular Family Fun Night on Friday. 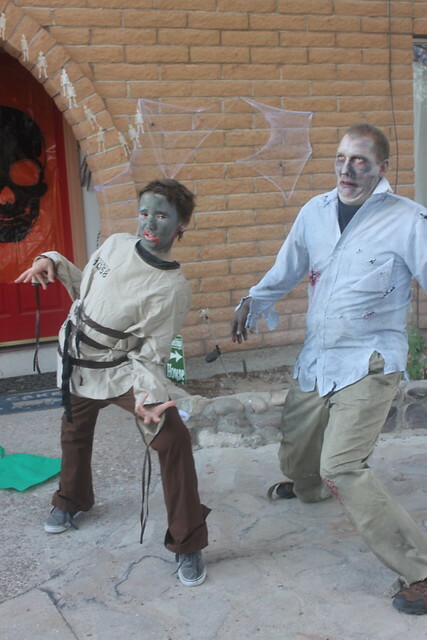 Derek and Jeremia were scarers in the haunted house. I had planned on taking tons of pics but we were so busy there wasn’t time. Luckily I got a couple of shots before we left. 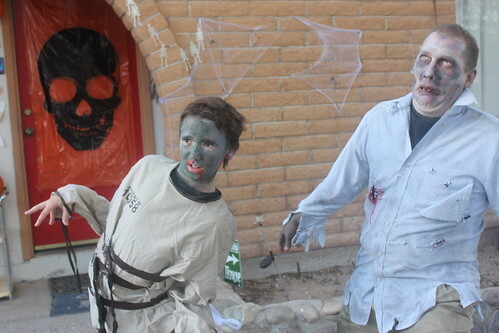 They had so much fun scaring everyone. I didn’t get a chance to go into the haunted house. I was too busy being the Pocket Lady. I wore a giant apron with 8 or 9 huge pockets on it. Each pocket had prizes. For 2 tickets each kid got to pick a pocket for a prize. Have a Happy Halloween, Pocket Lady. This is the first year the girls haven’t dressed up, or we’ve gone somewhere or done something… So it is a little strange. But I think we’re going to have a pizza party and I think i’ll carve the last pumpkin! The makeup was a group effort, done in a rush out the door. People were coming up to me all night telling me how scary they both were. Derek was actually laying on the ground dragging himself along. People kept mistaking him for a dummy and just when they thought they were safe he would spring to life. Enjoy your pizza party! I remember the pocket lady! She was my favorite!! I had never heard of the pocket lady until this. I was a big hit. It’s so much fun to give away prizes!